This comprehensive guidebook to Yellowstone National Park comes as an e-book in ePub, PDF, and Mobipocket (Kindle) formats. List price: $14.99. Do you want to try before you buy or introduce a friend to the treasures of Yellowstone National Park in a short format? Announcing Visiting Geyserland, an ebook of ten geyser basin walking tours in Yellowstone, excerpted from the Yellowstone Treasures 4th edition guidebook. 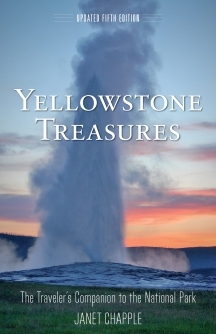 Download either Yellowstone Treasures or the Visiting Geyserland ebook on iBooks, Kobo, Google Play, Amazon.com for the Kindle (select the smaller cover image below), Barnes & Noble for the Nook, and elsewhere. Many independent bookstores now link up with Kobo to offer the ebooks—select the IndieBound image below for your local bookstore. If you like, you can even contact me and I will sell it for $14.99.